Get your team together and roll up your sleeves! During this live in-person team coaching, David Meerman Scott comes to your office to coach your team to reimagine ways to reach your audiences. Fill out the form below to get started. 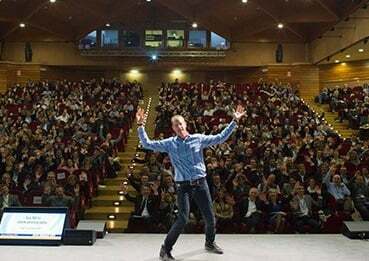 David Meerman Scott comes to your office to coach your team to reimagine ways to reach your audiences. Learn to take advantage of new real-time marketing and sales realities. Then set your organization up to exceed your goals by implementing new low cost (and no cost) strategies and tactics that are proven to grow business. By the end of the day with David, your team will be eager to implement the new ideas. Everybody will be armed with a clear set of objectives and ready to implement actionable and fresh real-time approaches that create immediate results. The live coaching session works, because David tailors each one from the ground up for your specific needs. He’s conducted similar events at dozens of varied organizations around the world including Dow Jones, Microsoft, United States Marine Corps, NY Islanders, Century 21, Jackson Healthcare, National Geographic, and many more. "When I returned from the airport after your New Rules of Marketing & PR presentation, my communications team was already in a meeting room next door, enthusiastically discussing your presentation and thoughtfully planning for short and long term application of your strategies. I couldn't help but smile that the desired outcome of your visit was so immediately apparent; before your plane had even departed, you were already making a difference in Cleveland."